2016 brought some of the most dramatic increases in home ownership costs in recent history. 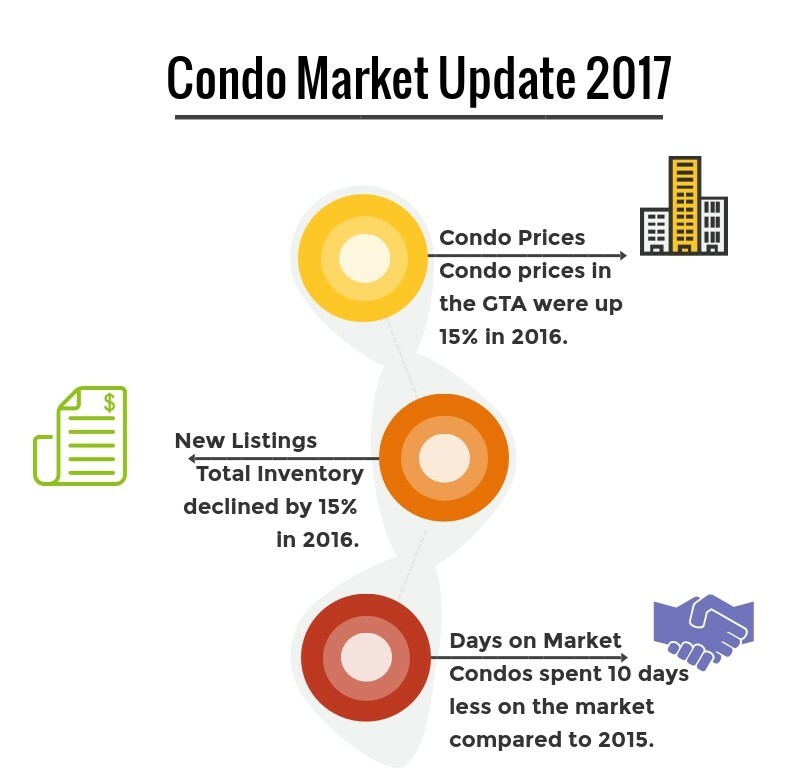 The fourth quarter of 2016 in particular saw an increase in condo sales by 22.3% and a decrease in new listings by 13.4% compared to last year. What this means is that despite the increase in sales over last year, supply remains constrained by the almost 15% reduction in condo listings. Pre-construction developers can barely keep up with the demand as most projects with occupancy dates in 2017 and 2018 are already sold out. Condos on average were also spending less time on the market. With same day sales becoming a reality for many home owners. In the fourth quarter of 2015, the average home would spend 33 days on the market before it sold. In 2016 this number has gone down to 23 days on the market. The average detached home in Toronto now sells for about $1.4 Million, a staggering 27% increase over last years figures. The average detached home in Mississauga sells for about $750,000. All low-rise home segments saw over 100% sale to list price ratio, meaning multiple offers and high competition are the new norm. With no sign of prices slowing down, condos have become an attractive option for first time home buyers, many of which can no longer afford single family low-rise homes. While detached and semi-detached homes saw the highest price increases, condos saw a more controlled growth at a modest 15%. Forecasts have marked 2017 as a year of similar growth, with expected condo price increases of 10-12%. The number of condominium apartments listed for rent in the fourth quarter of 2016 was down substantially (-14.2 per cent) compared to Q4 2015. This lack of inventory was at the root of the dip on rental transactions (-5.8 per cent). The average one-bedroom rent for the TREB market area as a whole was up by 7.4 per cent on a year-over-year basis to $1,776. The average two- bedroom rent was up by 8.0 per cent to $2,415. Given these trends, many buyers are now purchasing condos with the intent to rent them out as a short term investment, and then sell them down the line in a couple of years. Home and Condo prices across the board have been rising over the past couple of years. Many home buyers who are on the fence or waiting for prices to settle down should be warned, as prices are not going back to 2016 or 2015 levels. At least not anytime soon. All indicators point to a continuing rise in home prices for 2017. As more buyers are priced out of detached, semi-detached and town-home houses, many are turning to condos as an affordable alternative. This means that your average condo will have a much wider appeal than a detached home simply due to the fact that more people can afford it. This translates to a wider audience when you list your condo for sale. Those same income earners who could afford condos five years ago are now finding themselves renting instead as they are unable to afford the increasing condo prices. What this means for any condo investor is a continuing increase in rental demand, which will continue well into the next couple of years. We hope you found this assessment both honest and informative. Please be sure to follow us on Facebook and Instagram for up to date Condo information around the GTA.